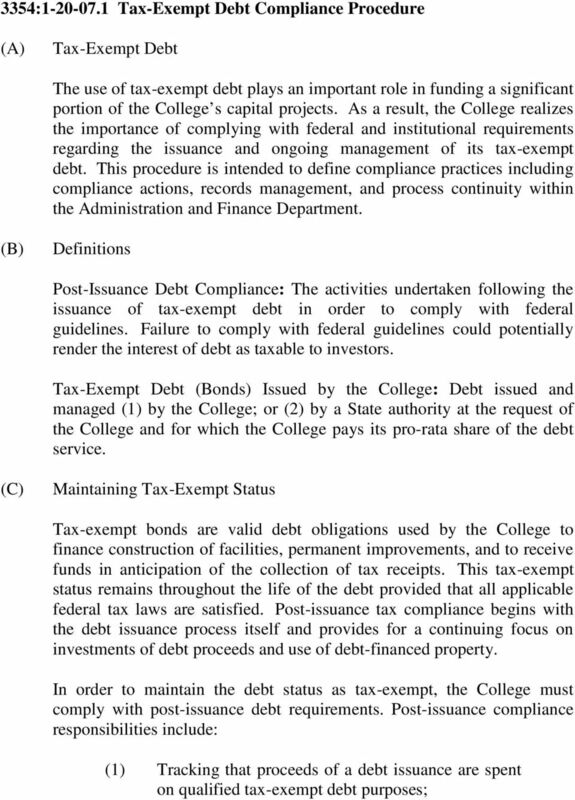 Download "3354:1-20-07.1 Tax-Exempt Debt Compliance Procedure. 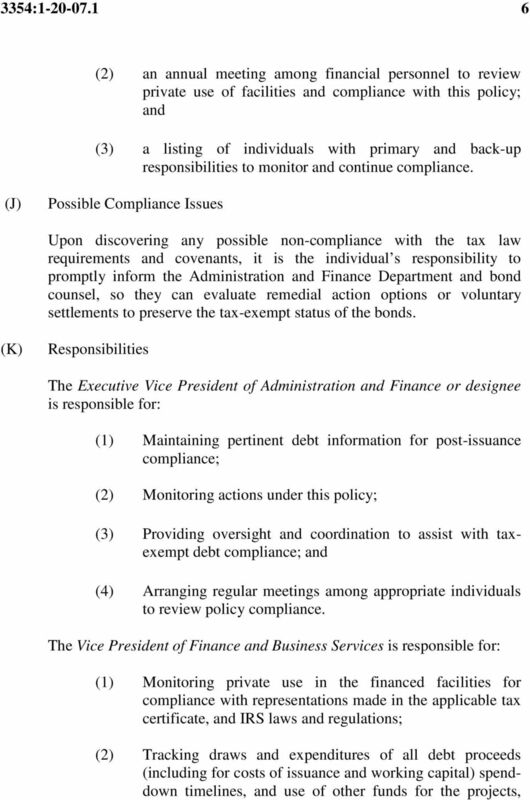 Tax-Exempt Debt"
2 3354: (2) Maintaining detailed records of all expenditures and investments related to debt funds; (3) Ensuring the project financed is used in a manner consistent with the legal requirements; and (4) Providing necessary disclosure information regarding financial and operating status annually. 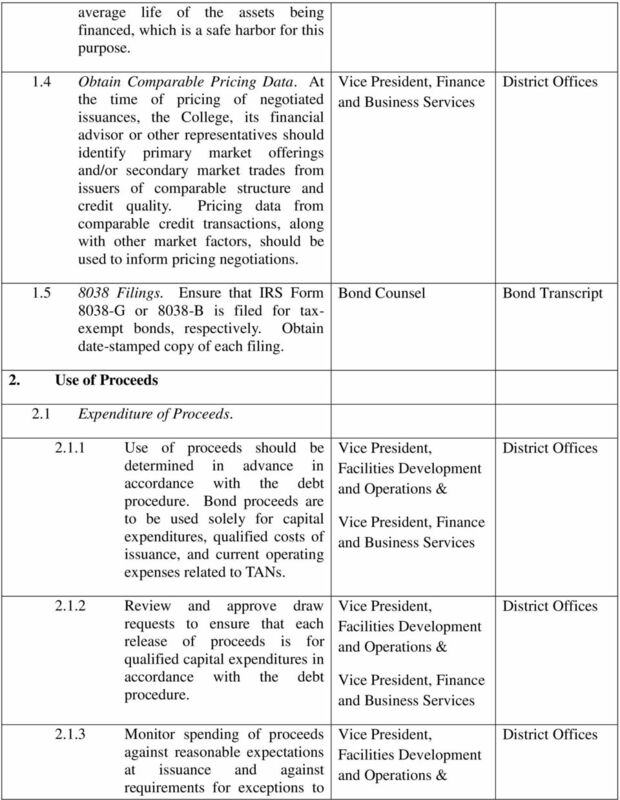 (D) Debt Issuance Process Before tax-exempt debt is issued, there are pre-issuance requirements to consider. 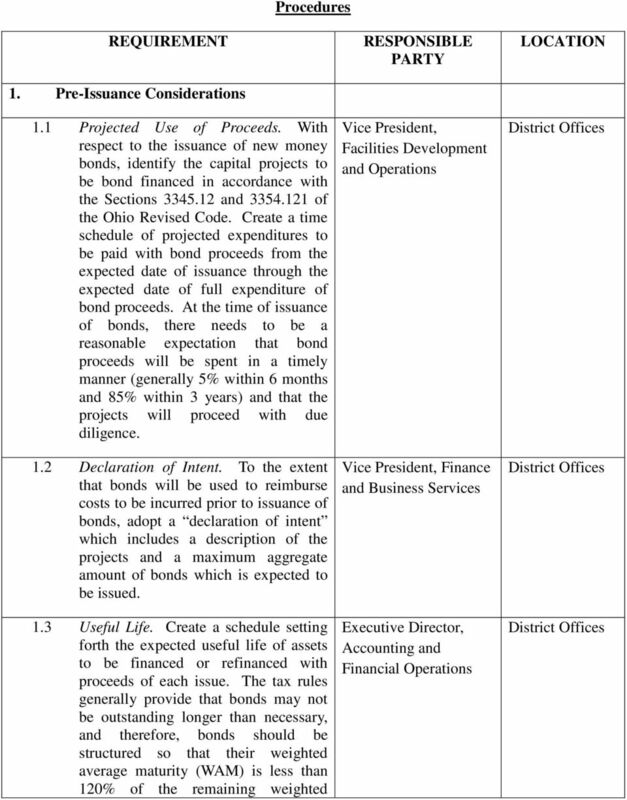 These include: (1) Creating a time schedule of projected expenditures to be paid with bond proceeds from the expected date of issuance. At the time of issuance, there needs to be a reasonable expectation that bond proceeds will be spent in a timely manner (generally 5% within 6 months and 85% within 3 years) and that the projects will proceed with due diligence. (2) Creating a schedule setting forth the expected useful life of assets to be financed or refinanced. The tax rules generally provide that bonds should be structured so that their weighted average maturity (WAM) is less than 120% of the remaining weighted average life of the assets being financed. 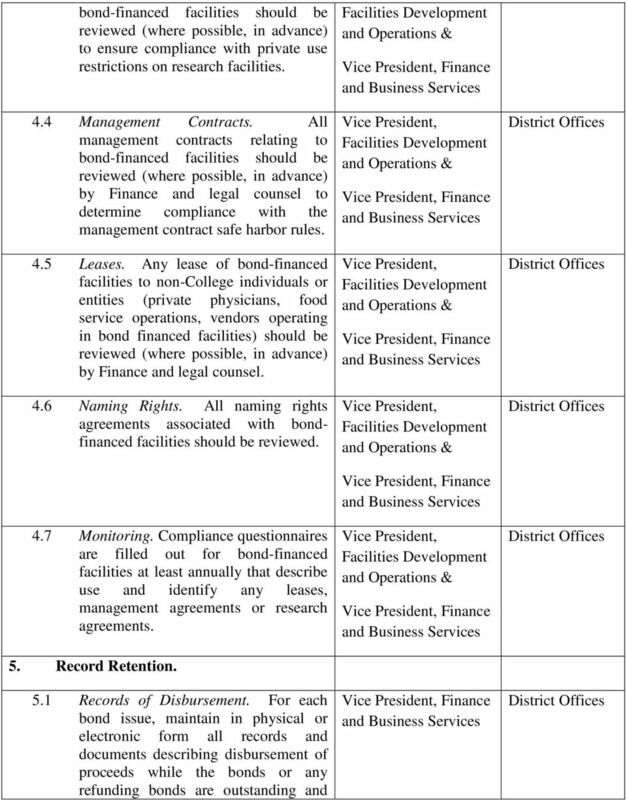 (3) Certain authorizations must be obtained by the Administration and Finance Department once projects and financing requirements are determined. 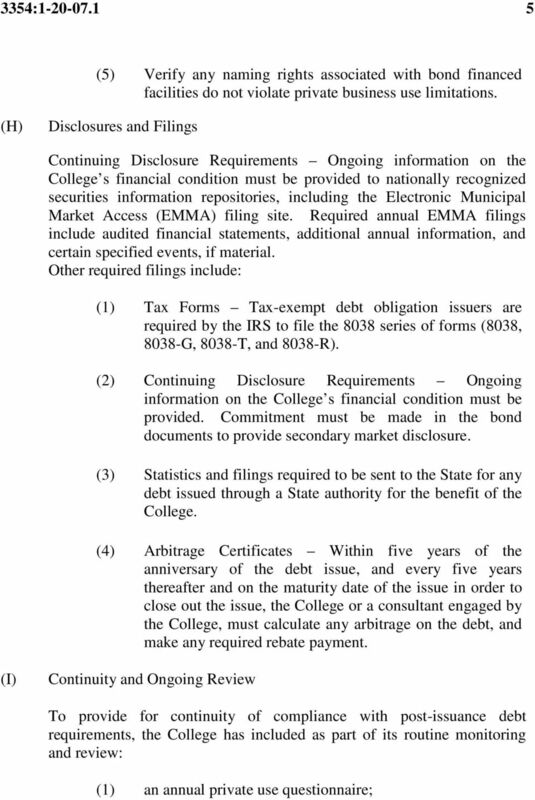 Notable authorizations include: (a) Declaration of Official Intent to Issue Tax Exempt Debt The College Board of Trustees passes a resolution authorizing the issuance of tax-exempt debt up to a specified limit prior to the College issuing tax-exempt debt for a project. 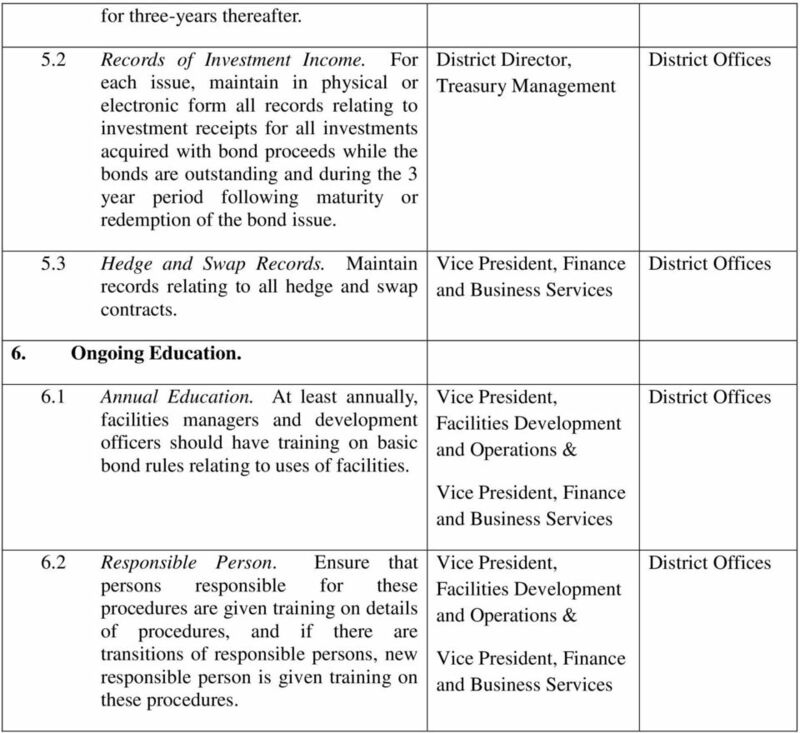 This resolution also approves pricing parameters and interest rate maximums for the debt issuance. 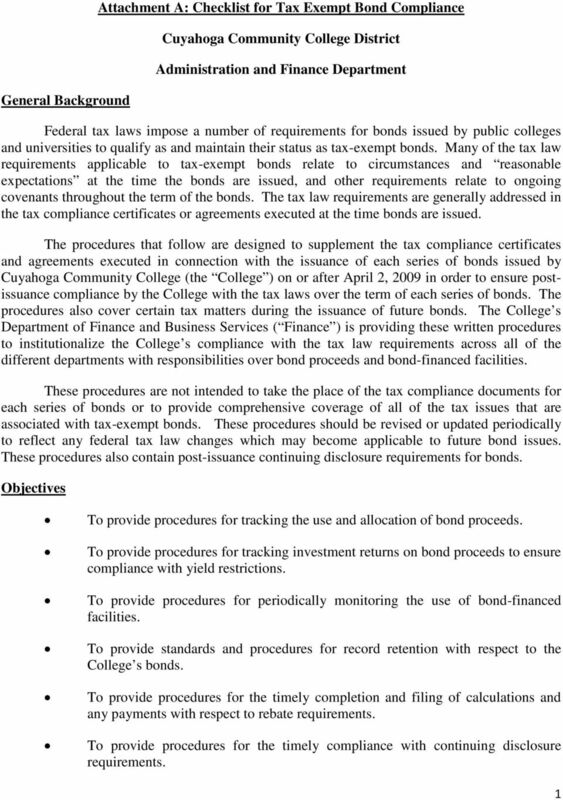 3 3354: (E) (b) (c) (d) Proceeds Tracking State Authorization If student fees are pledged to secure bonds or notes, then the College must seek approval from the Ohio Board of Regents prior to issuing the debt. 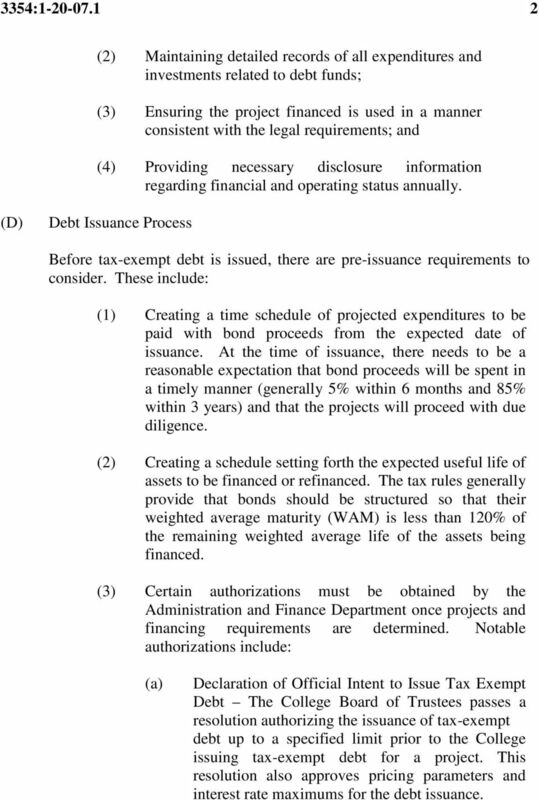 Legal Opinions A legal opinion issued by bond counsel, who opines on authorization and the taxexempt status of the interest on the debt being issued. Tax Certificate This is also known as an Arbitrage Certificate and is provided evidence compliance with applicable laws and regulatory requirements related to the issue of tax-exempt debt. 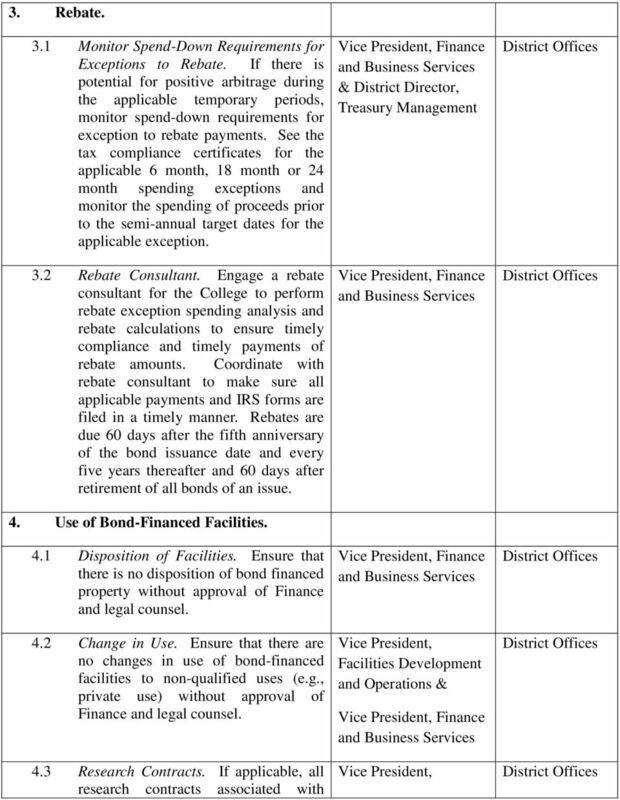 The College allocates debt proceeds to the various projects being funded with the tax-exempt debt. The spending of the proceeds toward eligible project costs is tracked along with the rate at which the proceeds are being spent. Debt proceeds used to pay issuance costs related to any debt are tracked by Treasury Management to ensure that such costs do not exceed 2% of the net proceeds of such debt. 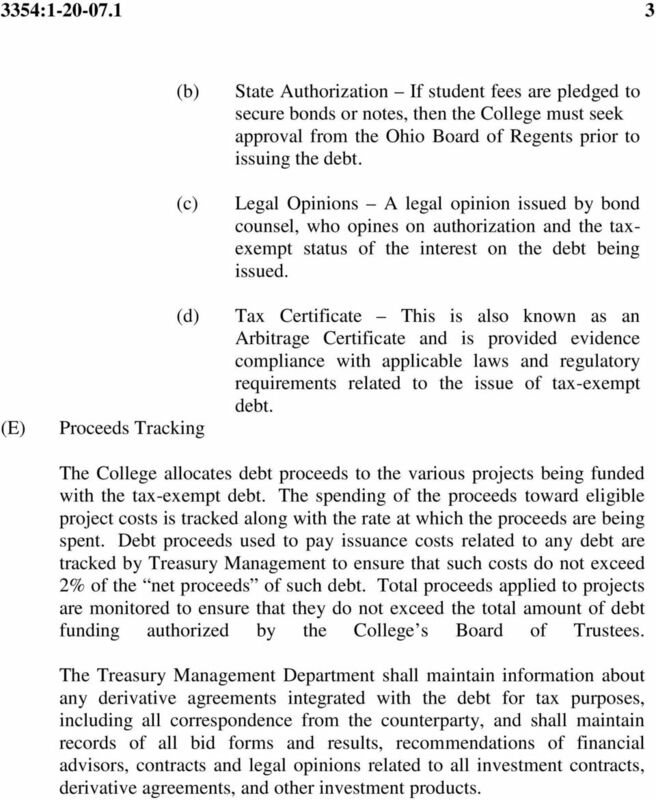 Total proceeds applied to projects are monitored to ensure that they do not exceed the total amount of debt funding authorized by the College s Board of Trustees. 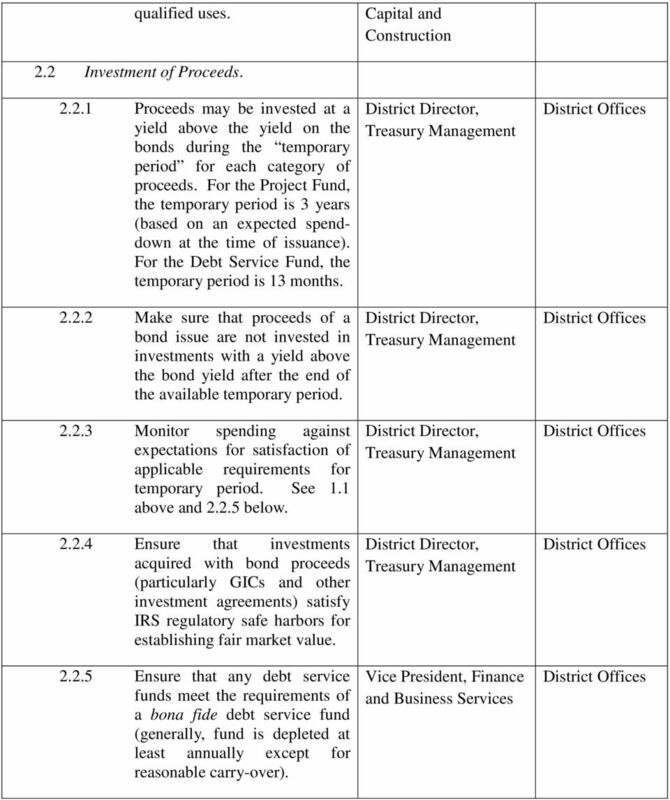 The Treasury Management Department shall maintain information about any derivative agreements integrated with the debt for tax purposes, including all correspondence from the counterparty, and shall maintain records of all bid forms and results, recommendations of financial advisors, contracts and legal opinions related to all investment contracts, derivative agreements, and other investment products. 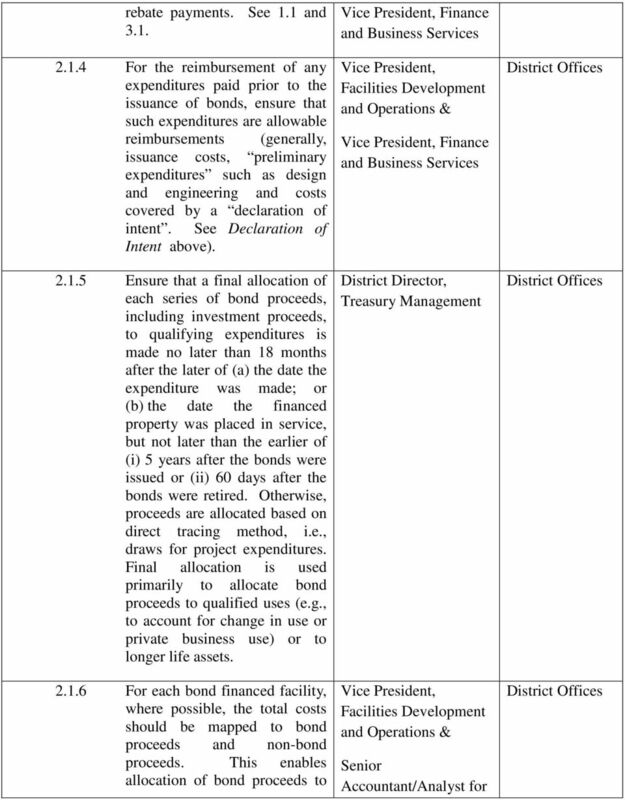 AFTER THE BONDS ARE ISSUED: THEN WHAT? ARTICLE I General. 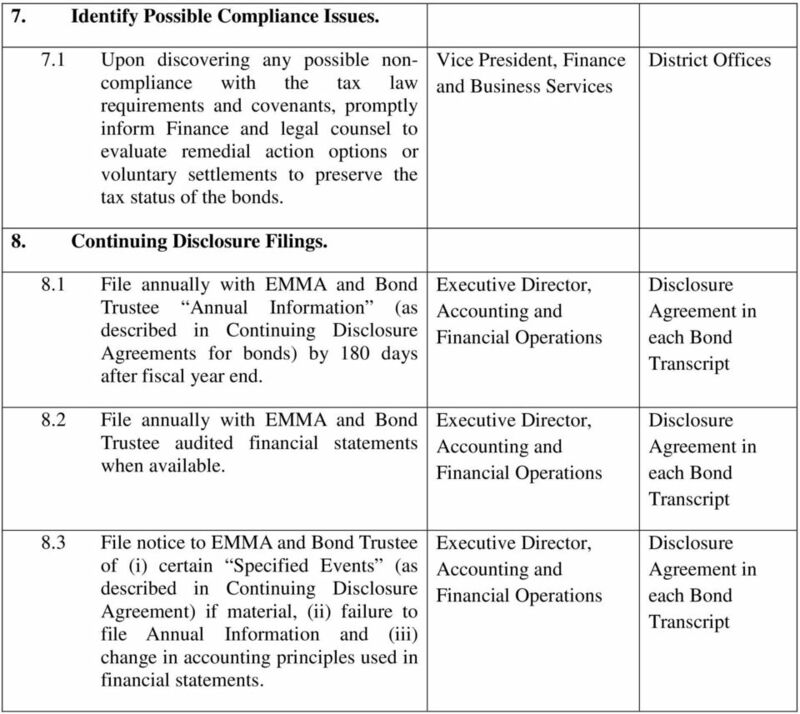 These Procedures are being adopted by the School District board of education as debt issuance disclosure best practices.